PennDOT Secretary Leslie S. Richards is passionate and committed to encouraging women and minorities to pursue careers and leadership positions in transportation and public service. As part of that commitment, Richards has brought her Moving Women Forward event series to academic institutions across the state to spark discussion on the important topic. 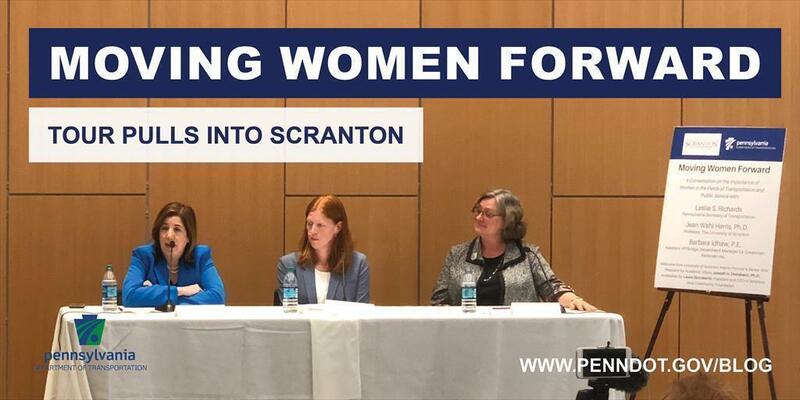 PennDOT Secretary Leslie S. Richards, seated left, brought her Moving Women Forward tour to The University of Scranton. Participating in the forum-style presentation were Dr. Jean Wahl Harris, seated right, and Barbara Idhaw, standing center. Laura Ducceschi, standing left, was the moderator, and Dr. Joseph H. Dreisbach made opening remarks. Most recently, Richards and Dr. Joseph H. Dreisbach, interim provost at The University of Scranton, spoke with more than 100 college and graduate students, faculty, and regional professionals about female leadership and gender parity in transportation and public service. Also participating in the forum-style event were Dr. Jean Wahl Harris, University of Scranton professor, and Barbara Idhaw, assistant vice president and bridge department manager at Greenman-Pedersen Inc. Laura Ducceschi, president and CEO of the Scranton Area Community Foundation, moderated the session. In opening the event, Secretary Richards said, "As the first female PennDOT secretary, I have to think about things like getting through the rest of the day after standing on a construction site wearing a hard hat or placement of a podium with the wind blowing in my hair — and while that can be funny, I've learned that above all, it's important just to show up so people can see what it looks like to have a female in this position." She continued, "Gender parity is not just the right thing to do — we know now that it helps to yield better decisions because we bring new ideas to the table and think about things differently. And that's why we're here today." According to a report from the U.S. Department of Commerce Economics and Statistics Administration (PDF), women filled 47 percent of all U.S. jobs in 2015 but held only 24 percent of science, technology, engineering, and math jobs. The Bureau of Labor Statistics states that roughly 15 percent of the more than 9.1 million people working in transportation and material-moving occupations are women. Other panelists shared their professional development stories and how they have carved out a niche for themselves in academics and public service.